e. Beurre noisette (hazelnut butter) and Beurre noir (black butter) are sauces of melted butter cooked until the milk solids and sugars have turned golden or dark brown; they are often finished with an addition of vinegar or lemon juice. 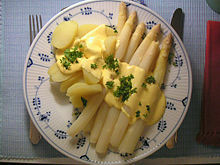 Hollandaise and bearnaise sauces are emulsions of egg yolk and melted butter; they are in essence mayonnaises made with butter instead of oil. Hollandaise and bearnaise sauces are stabilized with the powerful emulsifiers in the egg yolks, but butter itself contains enough emulsifiers—mostly remnants of the fat globule membranes—to form a stable emulsion on its own. Beurre blanc (white butter) is made by whisking butter into reduced vinegar or wine, forming an emulsion with the texture of thick cream. Beurre monte (prepared butter) is melted but still emulsified butter; it lends its name to the practice of "mounting" a sauce with butter: whisking cold butter into any water-based sauce at the end of cooking, giving the sauce a thicker body and a glossy shine—as well as a buttery taste. In Poland, the butter lamb (Baranek wielkanocny) is a traditional addition to the Easter Meal for many Polish Catholics. Butter is shaped into a lamb either by hand or in a lamb-shaped mould. Butter is also used to make edible decorations to garnish other dishes. Mixing melted butter with chocolate to make a brownie Butter is used for sauteing and frying, although its milk solids brown and burn above 150 °C (250 °F)—a rather low temperature for most applications. The smoke point of butterfat is around 200 °C (400 °F), so clarified butter or ghee is better suited to frying. Ghee has always been a common frying medium in India, where many avoid other animal fats for cultural or religious reasons.